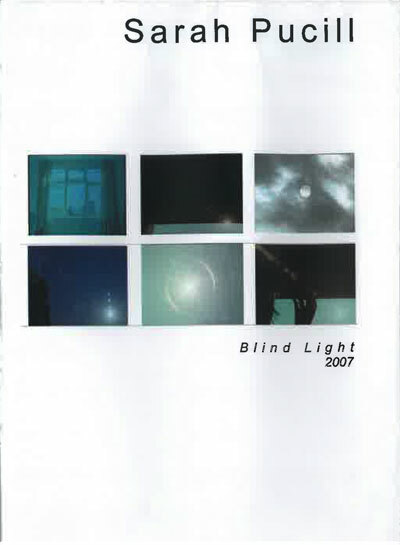 Blind Light is filmed in the artist's London loft. The presence of camera, studio and artist/performer are registered through image and sound, the loss of the former filling out the presence of the latter. In this way the physicality of object, space and subject as well as their interiority is fleshed out, mapping out a space that is at once material and psychical. Controlling the light she allows into the frame, the artist lifts the blinds or pulls them shut, applies or removes lens filters, opens wide the aperture or closes it. Each performance or action threatens the image as it shifts in and out of 'proper' exposure until it disappears completely. Focusing either on the window or the sky, the artist narrates her camera operation whilst also describing what she sees; intermixing receptive and projective vision. 'I can't look', she says, 'the clouds are coming in', 'there's been no rain for weeks', 'the eye burns, swells, looses focus and disappears in a stream'. Between aperture, eyeball, sun and moon, source and projection swap place. The film journeys from the grounded reality of the here and now – audibly represented through footsteps, birds and traffic, to a psychical space expressed through voice and abstraction. Blind Light explores the fold between the materiality of film, the psyche and the body. Please note that this DVD is for individual purchase only, for institutional sales please contact LUX directly. Blind Light is filmed in the artist's London loft. The presence of camera, studio and artist/performer are registered through image and sound, the loss of the former filling out the presence of the latter. In this way the physicality of object, space and subject as well as their interiority is fleshed out, mapping out a space that is at once material and psychical. Controlling the light she allows into the frame, the artist lifts the blinds or pulls them shut, applies or removes lens filters, opens wide the aperture or closes it. Each performance or action threatens the image as it shifts in and out of 'proper' exposure until it disappears completely. Focusing either on the window or the sky, the artist narrates her camera operation whilst also describing what she sees; intermixing receptive and projective vision. 'I can't look', she says, 'the clouds are coming in', 'there's been no rain for weeks', 'the eye burns, swells, looses focus and disappears in a stream'. Between aperture, eyeball, sun and moon, source and projection swap place. The film journeys from the grounded reality of the here and now – audibly represented through footsteps, birds and traffic, to a psychical space expressed through voice and abstraction. Blind Light explores the fold between the materiality of film, the psyche and the body. Please note that this DVD is for individual purchase only, for institutional sales please contact LUX directly.